Cowrote feature named À vos marques… party! 1 and 2. They generated over 3.5 million dollars at the Quebec box-office. Wrote the feature film screenplay for Mafiaboy (in English). Adapted two novels (Sous la toge and The Making of Minty Malone) and one memoir (Out Standing In the Field) as feature films. Worked on the development of tv shows (adult and youth market) for Radio-Canada, TVA, Télé-Québec, Canal Vie, ZTélé. Wrote interactive/gaming scripts for various clients, including Ubisoft (employee training), 42 Comets (e-learning and gamification), UgroupMedia (personalized videos), and Eureka Productions (documentary content and online game). Wrote, directed and produced two shorts films: Façade (distributor’s site) and Ethics of Twilight which won prizes at various film festivals, including the New York Short Film Expo. Course Lecturer at University du Québec à Montréal (Winter 2016 and 2017). Course: electronic literature and digital media writing. 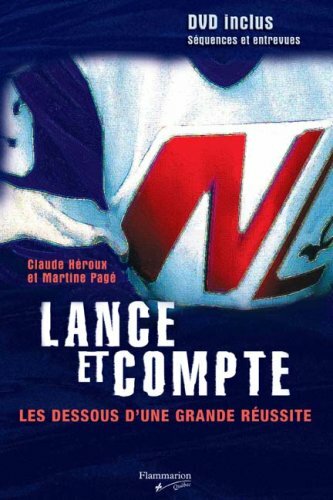 Cowrote the book Lance et Compte: les dessous d’une grande réussite with Claude Héroux (Flammarion, 2006). 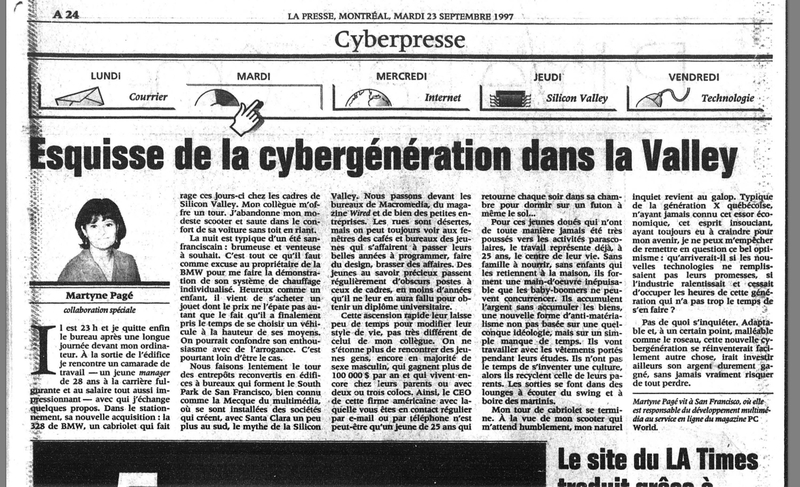 Wrote tech related magazine articles for Elle Québec, Clin d’oeil, Largeur, Jobboom, Affaires Plus, Chatelaine. New media/Web consultant for various corporations and associations, including: Gesca, NFB, Espace Infusion/INIS, Gouvernement du Québec, FPJQ. On air tv tech reporter for ID Maison (TVA) and radio shows (Radio-Canada and Rythme FM). Reporter for Radio-Canada’s tech related public affairs show called Branché. Won a Gemeau (Gemini Award) for best research for a public affairs tv show. Worked at PC World Magazine (1994-1998) as a multimedia development manager. Segment producer for various tv shows on Télé-Québec and ARTV. Directed a weekly tv show called La santé en vedette (Canal Vie). Segment producer for Radio-Canada’s tech related public affairs show called Branché. Bazzo.tv, Clin d’oeil, Le Devoir, Le Journal de Montréal, La Presse, Radio-Canada, L’Actualité, Châtelaine, Elle Québec,The Gazette, The Mirror (10 best blogs in 2005), Le Matin (Switzerland). Member of the board administrators of SARTEC (2012 to 2018).